The sign said the pears were free. I have seen the word free often. In fact almost everyday when I collect my mail I am offered something, some plan or some wonderful excursion FREE. Often there is an (*) beside the word free because the item is free only when certain other items or options are purchased. Then there are those rare times when something is free, such as the case in a store opening and an item is given away to entice us into the store. Or, to introduce us to certain major products we receive a free sample in the hopes we will become enthusiastic and ongoing customers. In this case, these free pears were actually free. I drove by this house on several different occasions during the harvest season and the display had grown to three or four boxes at one time or another. 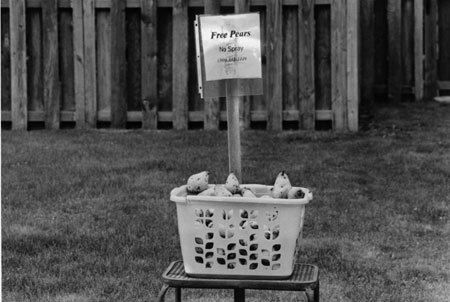 Remarkably, the pears were also picked and put into the front yard for passersby to glean. We all seen signs that say you can have them if you pick them. This grand example of humanitarianism should not go unnoticed. And too, it would be great if everyone and every business searched deep inside themselves and their basements and warehouses to find the same sharing potentials.